There was no prank—and I was being facetious rather than prescient—but those of us who stayed to the end nevertheless were fools. The grand social media experiment is over. RIP, Google+: June 28, 2011 – April 2, 2019. At final count, more than 380 loyalists took refuge in the late-days community: “Lights Out Google+ (For Those Who Will Stay To The Bitter End)”. Yesterday, among us there was lots of banter, lamenting, and counting down until Midnight Eastern, then Pacific, Daylight Time. But the service continued overnight until earlier today, before parent company Alphabet closed the doors after evicting us as promised. The structure is in process of demolishment, so to speak. All that remains for me, surprisingly, is an apparition. I had left the “Lights Out Google+” page open in a browser tab, where it remains locally cached. Refreshing or closing the tab will turn out the lights for user Joe Wilcox. Alphabet was wrong to shutter the social network. I agree with Rachel England, who for Engadget writes: “Farewell, Google+: You didn’t fail, you just didn’t succeed“. Whatever Google’s original plans for Plus, the thing evolved into something quite unexpected: A gathering place for enthusiasts of all varieties and interests, particularly geeks and (not surprisingly) Google devices and platform users. As I have said for years: The best marketers are enthusiasts. They are any brand’s true evangelists. Google+ was a resource of the best kind: People, not by their numbers but by who they were. Artificial intelligence and algorithms are staples of the Alphabet toolkit. But, I contest, nothing replaces the reactions, and interactions, of real people. Hell, Facebook gets it, as evidenced by its data mining Likes and other mechanisms. But Google+, while arguably much smaller, could have provided greater value; brand and product enthusiasts could have been great resources if tapped. They weren’t. Google+’s streamlined but efficient user interface encouraged meaningful interaction without distraction—nor the narcissist tendencies that make Facebook such a cesspool. Last month, on Google+, I lamented going to the coffee shop today “where I can observe the Zombie Apocalypse, as the iPhone-clutching infected obsess over Instagram, Snapchat, and WhatsApp—and the most hideous creatures croon over Facebook. 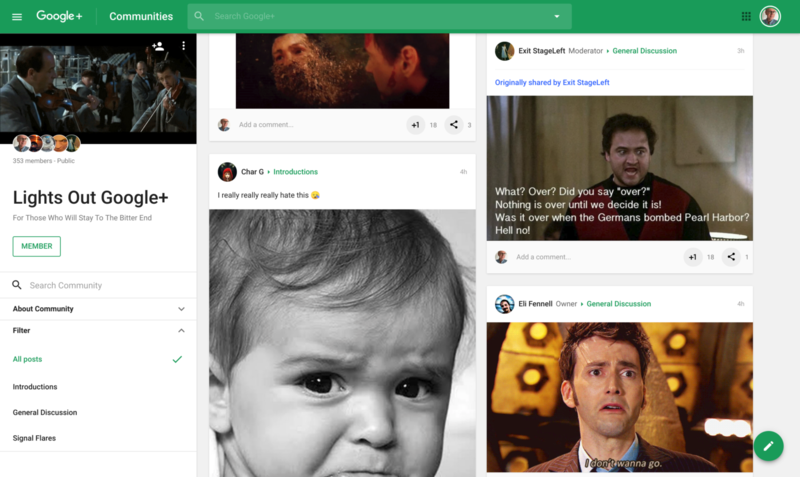 All the while knowing that the last vestige of intelligence and humanity—Google+—is gone. For ArsTechnica, Ron Amadeo pleads: “Please just stop closing things. Google’s constant product shutdowns are damaging its brand”. His analysis is a must-read. Key takeaway: “We are 91 days into the year, and so far, Google is racking up an unprecedented body count. If we just take the official shutdown dates that have already occurred in 2019, a Google-branded product, feature, or service has died, on average, about every nine days”. If you consider the large number of things shuttered by Google, and not just in 2019, they share at least one thing: Loyal users, even if a small number. Enthusiasts. Users who should matter the most but are treated the least. More broadly, there is the problem of trust. Why would anyone commit to using a Google device or service that might be killed off sometime in the not too distant future? Honestly, the Google+ closure in context of all the other killings, has me rethinking my commitment to the company’s products and services. My first blog posts on my website go back to 1996. Imagine had I committed them all to Google+, or some other sharing service, only to have them yanked and lost forever. Brands that lose enthusiasts’ trust will not last. Google has broken my trust with too many closures over too many years. Last night, as the last loyalists chattered and commented in the “Lights Out Google+” group, I mixed my responses and plus-ones with using Google Takeout to export my content and using another tool to import into MeWe. The newer social network looks lots like G+ at first glance but carries along the worst design decisions of others, like Facebook. Seriously, Friend requests? I don’t have time. A modern public forum should require me (and you) to do less, rather than more, manual processes. MeWe is a great place for my Plus history to be, but I don’t see myself being meaningfully active there—or anywhere else online. And so here we are, the last meaningful G+ community, 300-plus standing like the 300 Spartans at the Battle of Thermopylae. We, too, are doomed to fall. But unlike Ancient Greece, our homeland will be lost. Our fight on this last battlefield is for a few final moments of comradery; Google fails us. And lastly: “It has been a privilege and honor to serve with you these past eight years. I hope to meet some of you in the great social media afterlife somewhere—or better yet—in person sometime”.